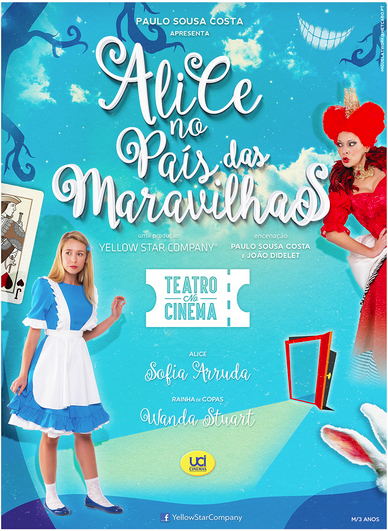 On 29th May, the Yellow Star Company will lead to scene the play “Alice in Wonderland – The Theatre in Film”, an inclusive session at UCI Cinemas El Corte Ingls in Lisbon. On stage from May 2nd , the piece of theater “Alice in Maravilhas- Theatre in Film” is an adaptation of a text Lewis Carol, Charles Lutwidge Dodgson’s pseudonym, english novelist of the nineteenth century. This presentation is distinguished by interaction between the cinema and the theater, since part is cinema (3D) and theater. This play will be leading names like Sofia Arruda and Wanda Stewart. The Session of next 29th at 11:00, will be a inclusive session to blind and deaf people. It can be followed in by Portuguese Sign Language and devices with audio description. “There once was a girl named Alice, who finds a talking white rabbit. Curious, Alice decided to follow him. Seeing that the stranger entered a rabbit burrow, she peered, and peeked … fell into a huge hole full of various animals and plants that speak a Hatter crazy one March Hare, too crazy, a cat laughing and a Queen Copas, who loves little intruders in his kingdom, the fantastic Wonderland where Alice will now live the strangest experiences.